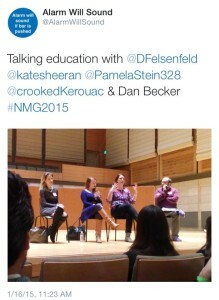 On January 15th to 17th, 2015, Pamela Stein traveled to San Fransisco, CA, where she was invited to speak on panels during the inaugural New Music Gathering. 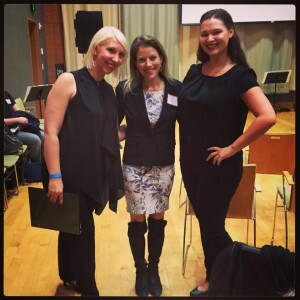 The conference, attended by a nation-wide community of new music composers, performers, educators, journalists, and more, featured guests such as Claire Chase, Kronos Quartet and Sarah Cahill during three days of lectures, demonstrations, round-table discussions, panels, networking events, and performances. The New Music Gathering, founded by Brooklyn based composers Daniel Felsenfeld, Mary Kouyoumdjian, Matt Marks and Lainie Fefferman, will come to a new U.S. city each year. 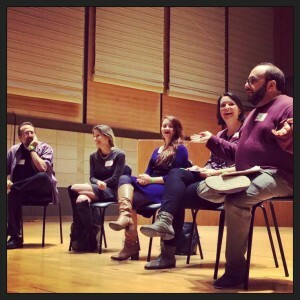 Pictured below are (L-R): Dan Becker, Pamela Stein, Brenna Noonan, Kate Sheeran, and Daniel Felsenfeld, during an education panel at the New Music Gathering.